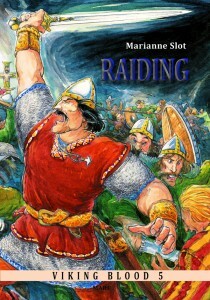 Fifth book in the series “Viking Blood” by Marianne Slot. “Look, Olav is swimming!” Styrbjorn cheers, pointing. Hauge and Torleif both look out at the water. Then Hauge starts. The boy is too far out; in the deep water. Just then a gurgling scream sounds from out there. Olav is splashing his arms wildly, and then disappears beneath the surface. Hauge races out there, his heart hammering in his chest. But where is the boy? Why didn’t they look at him? That boy is always bringing himself into trouble; a real daredevil. Always trying to climb the tallest tree, or climbing at the edge of the steepest slopes. Three and a half years have passed since young Styrbjorn, Edwina and Hauge’s son, was born and Edwina is pregnant again. The winters have been extremely hard and the harvests have been poor. Famine and hunger threatens. In the autumn Edwina gives birth to twin girls. But everything goes wrong. The grain rots, only some of the ships return from the summer voyage; late, empty, and battered. Then Hauge decides to go on a quest for food and riches in England. A new ship is built for the voyage: Long and slender; fast and seaworthy. In England they cause terror and devastation. Town after town is raided; left pillaged and plundered. ”This book, too, tells a very dramatic story, but the reader also learns a lot of the period. 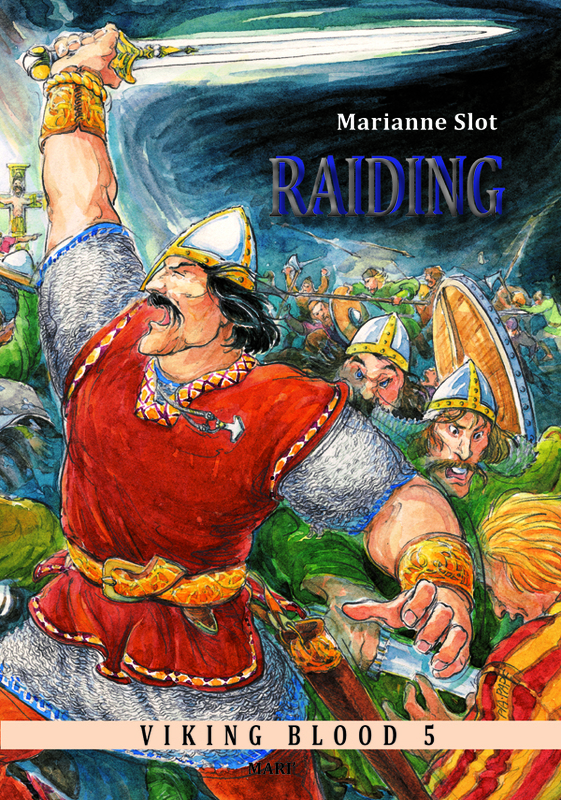 Pia Falck Pape’s poweful illustrations compliment the story. ”The book lives up to its predecessors. It’s an easy read and well told Viking tale, that paints both a dramatic picture of the period, and tells of the harsh living conditions of the Aera, entirely in the power of nature. Odin had kept a close eye on the proceedings in the small village. He regularly sent Hugin and Munin to the southern part of Norway, and they returned with tales of Hauge’s voyage to Iceland and Haithabu. And of the good trades he had made in Haithabu with the walrus Tusks from Iceland. So, now with young Styrbjorn thriving and giving his parents plenty of joy in life, everything seemed to be as it should be. However, of the following year, the ravens could tell Odin that Edwina had yet again been with child. But she gave birth prematurely, why the child wasn’t viable. They could also tell that as winter set in it was both more cold and lasted longer than anyone had ever heard of. When the sun finally returned it melted the snow, so fast that it flooded the fields and flushed the good soil away. Still, though, in early spring the humans sowed the poor soil, hoping. Several even sacrificed to the Gods in the fields, especially to Freya. In spite of that, the spring gales swept the seeds away. So the humans didn’t know what to do. Some even talked of turning to a new God! When Odin heard of that, he was furious. Humans shouldn’t treat him like that! Yet, time passed, and young Styrbjorn turned into a lively and energetic boy. Edwina once again became pregnant, and Odin was as pleased as Hauge and Edwina when all signs now showed it to be a success. By mid-summer, he once again sent the ravens off. This time they returned exhausted, huffing and gasping for breath. Never – ever had they experienced this hot a summer, and such a draught. “Well, Hauge knows only what he knows,” Odin sighed and scratched his head. “Come on out here, Styrbjorn! It’s nice and warm!” Hauge entices the small boy, who’s sitting by the water’s edge. Styrbjorn is naked, and he looks as if he wants to enter the water; even if it is a little dangerous? He splashes the water with his hands, testing it, laughing waveringly at Hauge. At that moment, Torleif with Olav by the hand walk down to them on the small beach. “Do you want to come?” he asks Styrbjorn. The little boy claps his hands eagerly, but still remains on the beach. Olav lets go of Torleif and hurries to Styrbjorn. He sits down next to him clapping along, too. Styrbjorn squeals out of happiness and rumps around in the sand. “You’re coming in – both of you!” Torleif says and takes one in each hand. Then he draws them with him into the water. One small step at a time, until suddenly, the water reaches their thighs. Styrbjorn and Olav cheer and laugh at each other. Then, splashing as much as possible, both run out along with Torleif towards Hauge, who’s floating on his back a bit further out. He splashes his legs, whipping the water into foam around him. As they finally reach him, he turns and open up his arms, and scoops both of them close to him! Time has passed so very fast! He can’t believe that more than three and a half year has passed since he held that small newborn child in his arms for the first time! Hilda’s boy, Olav, has grown into a big boy, too, but then he must be six by now. The two boys are really fond of each other, and are nearly always together. But then, so are their mothers. Hilda is a good help around the house, especially now Edwina is with child again. Hauge holds Styrbjorn in his arms and gives him a good swing. And Styrbjorn squeals in delight when Hauge bends his knees as he swings him. That way, the water splashes everywhere and Styrbjorn is almost submerged. “Me too! Me too!” Olav cheers and he gets a turn, too. “Ah, this is nice,” Torleif says, coming back from a swim a little further out, where the water is really deep. Torleif stays in the water with the boys, while Hauge walks up and lies down on the small beach. This is the exact spot where he found that big nugget of amber ten years ago, which he then used to save Hannibal’s life. The nugget was used as payment for a passage on a ship for Hannibal, so he could escape the furious Sven, who had wanted to kill him. Wonder how Hannibal is? It has been years since they separated in Haithabu. But Hannibal wanted to go back home to England. Will he ever come back here? It was quite a clever present he had given them! The thought of it makes Hauge smile. They weren’t allowed to open it until their first child had been born. When, after a few months, Styrbjorn looked as if he would survive, they held a spring Blot. It was on that occasion that Lauge Longsight was married to Liv; and about time, too. They had fancied each other ever since she arrived at the village with Hannibal. But Lauge’s mother, Sigrid, had opposed the union. After all, Liv was only a freed thrall, and thus not someone you marry. However, when she learned that the girl was with child she had given in. At the Blot and wedding, Styrbjorn was presented to the Gods by both Aasa and the village Gode. “Now we can open Hannibal’s present, ”Edwina had said that night. They had both laughed when they saw what it was. Hannibal had had the smith forge a small silver talisman; a cross and a Thors hammer, intertwined! Hauge looks at the blue sky; there is not even one small white cloud to be seen. At midday the heat is insufferable. You have to be either in the shadow, or down by the water. Rain is badly needed, though. In the fields the crops look poorly, the grain has already turned yellow, even though it isn’t ripe yet. Even the grass on the mountainsides has almost withered away, why the shepherds must seek pastures further away for their animals. Quite a lot of animals have already succumbed. So, if rain isn’t falling soon, surviving the winter will be difficult. As if they haven’t already had their share of harsh winters. The winter where Styrbjorn celebrated his first birthday was both very long and tough. Sigrid died around Winter solstice. Even though Astrid had done her best to save her, Sigrid simply coughed herself to death. She really did look forward to Liv giving birth, though it was probably for the best that she wasn’t around to see what happened. Liv nearly died giving birth and the child was so deformed that they had to leave it in the woods to die. Fortunately, Liv soon became pregnant again, and this time the child was healthy, although Lauge would have preferred a boy. “Aren’t you coming in again?” Torleif asks as he comes out of the water. He has Styrbjorn by the hand. Olav is floating on his stomach a little further out, splashing happily in the water. “Torleif is teaching me how to swim!” he yells enthusiastically at Hauge. Hauge smiles and waves at him. “Do you regret staying at home this year?” Torleif asks, while Styrbjorn crawls onto Hauge’s stomach. But where is the boy? Why didn’t they look at him? That boy is always bringing himself into trouble; a real daredevil. Always trying to climb the tallest tree, or climbing at the edge of the steepest slopes. Still, they had no idea that he would dare to go that far out in the water on his own. Especially considering that he can’t swim yet. But he must have believed he could! And then the current has swept him further out. Now Hauge is close to where Olav disappeared. The water is really deep here; the seabed takes a steep plunge down here. So Hauge can’t reach the bottom either. He inhales deeply and dives in. However, seeing anything is difficult. The seabed is filled with big rocks and seaweed. Back to the surface again, inhale, and then down again a little further out. Finally, he sees him! The boy lies lifeless behind a big rock! Hauge rushes back up with him. Torleif is waiting on the beach, holding Styrbjorn in his arms. When he sees that Hauge is on his way in with Olav, he puts the boy down and rushes out to help. They turn him upside down; thumping his back. “Come on! Come on, breathe!” Hauge says determined, shaking the small limp body. Suddenly, Olav coughs and vomits convulsively. Water and vomit cascades out of his small body. And then he starts crying. As they draw close to the big house they live in now, rumour is ahead of them. Edwina shoots out of it; Hilda following close by. Edwina is out of breath in no time, so the two women stop and wait for Hauge and Torleif to reach them. Then Edwina takes the boy from Hauge and shakes him gently. “What have you been up to?” she asks him, before handing him to Hilda, saying something in their own language. Apparently, she has momentarily forgotten that Hauge doesn’t like it when speaks in that. But he let it pass. Right now, the important thing is that the boy is alive! Hauge has enticed Edwina out walking a warm and sunny fall day. It’s not good for her to always stay inside. They pass the place where the long house used to be before it burned down last summer. Back then, it was hot and dry, too, why it only took a tiny spark from the fireplace to ignite it. And less than a minute before the flames engulfed it. It was completely gutted, why Hauge built a big new house in its place. Now they use the largest room in that for feasts and gatherings. Aasa lives in their old house with her new husband. Ulf had lost his wife the year before, and they found it practical to wed each other. Edwina’s walk is slow and troubled. Now and then, she clutches her stomach. “Is it kicking?” Hauge looks at her. She nods. “It will come any time now,” she sighs. They stop and look out over the sea. “The ships might be here soon, too,” Edwina says. Suddenly, Edwina crouches, clutching Hauge. “I think – we need to hurry back!” Then she turns completely white-faced and sways strangely. As if she’s fainting. Luckily, Astrid comes running from Lauge’s house. She must have seen them. She takes hold of Edwina’s arm, and Hauge supports her on the other side. Together they manage to bring her home to the house and call for the birth-aides. The women rush back and forth: bringing water and blankets. They have no time for him; he’ll just have to wait. The men, whose wives are with Edwina, drops by to talk, asking whether it is a complicated birth. All Hauge can do, is shrug. “It wasn’t the last time,” he says. “She’ll probably do all right.” But deep down, he’s nervous; it does seem as if the women are nervous too. The girls who’s looked after Styrbjorn and Olav, approach the house with the boys. “Has she given birth yet?” one of them asks. “I don’t know,” Hauge answers, lifting Styrbjorn up into his arms, as one of the girls passes him carrying Olav. “You can’t, not now,” Hauge mumbles. At that moment, they hear the cries of a newborn from inside the house. Hauge hurries to the door, but Aasa stops him. “You can’t come in now,” she says determined. “Is something wrong?” Hauge asks, suddenlyscared. Then sheturns around and disappears inside the house. A lot of people have now gathered outside the house. They talk in hushed tones, trying their best to cheer up Hauge. But they can’t avoid hearing the sounds from the house: the muffled yells, sharp cries of pain, and the nervous voices. Suddenly another child is crying! Then, silence. A little while later, Aasa comes out to them. Edwina tosses and turns hazily in her bed. The women fuzz around her, and Astrid is bent down over her. She’s wiping Edwina’s forehead with a moist cloth, and gives her something to drink. Hauge takes Edwina’s hand, but she doesn’t react. It’s as if she’s far away. She sighs and moans, and doesn’t even look at him. Then she mumbles something incomprehensible. “What?” Hauge asks and leans close. But she simply stares, eyes wild from fever. As if he’s not there. “We hope this will help her,” one of the women says quietly, as Astrid gives Edwina more to drink. “What is it?” Hauge asks. Hauge approaches the bed by the other wall. There, Hilda sits with two small lumps of cloth, one of which is crying. He looks at them lovingly, and caresses softly the tiny foreheads and cheeks. They are so small! But they look whole and complete. “They will be fine,” Hilda says, comfortingly. The room is full of strange noises from Edwina. Sometimes it sounds like words in a foreign language. “NO!” Edwina suddenly screams. “No, no! Don’t say it! Not that! Not that!” She immediately resumes her calm, yet dazed and incomprehensible mumbling. Hilda looks at her. Then, hurriedly, she hands one of the girls to Hauge. “Go, go outside. Show her to the others,” she says in a panicked tone. “No, no! It was – we weren’t…“ Edwina yells. But Hauge stands still. Something is wrong, terribly so. Why is it as if all Hilda wants, is for him to leave? “Where is he?” Edwina yells. Hauge moves over to her. He’s right here. She must know that. He really wants to comfort her. Hauge stops dead. Olav? She’s really babbling, and obviously doesn’t know what she’s saying. But then he feels Hilda’s eyes on him. He looks back at her. But she just cast her eyes down. Something IS wrong! Hauge is stunned while Edwina sinks back into her incomprehensible mumbling again. Olav? Edwina’s son? What’s this? 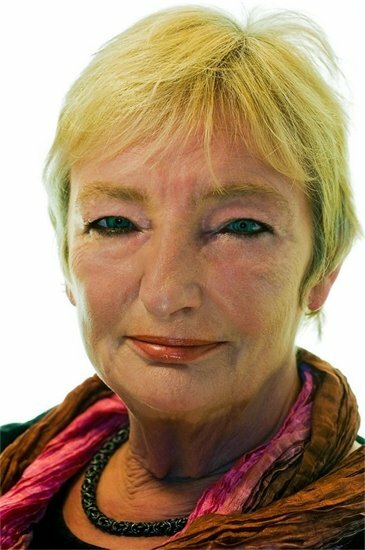 “She – she’s in a haze, just muttering, she – m-mistaking the na-names,” Hilda stutters. Hilda’s suddenly left speechless. Everyone stares astonished from her to him. “It was – t-the same!” Hilda stutters. “WHAT did she say?” Hauge screams furiously, his control lost, boxing Hilda a blow on the ear. “She said that Olav – that he is her son, ”Hilda cries. “And who, may I ask, is the father?” Hauge roars franticly. When Hilda doesn’t answers immediately Hauge boxes her ears again. “It’s – it’s – Haakon!” she sobs. Hauge is just about to hit Hilda again when Aasa grabs his arm. Edwina is screaming wildly in pain and terror, as the women fight for her life. Everything is chaos.